The benefits of having a highly educated, independent and proactive staff include gaining a competitive advantage, enhancing creativity and nurturing innovation. The down side is that many professionals resist direction, question authority and like to be their own boss. Professionals of all sorts can be difficult to manage. New graduates have been schooled to question instructions rather than follow them; old timers have mastered the art of appearing to follow instructions whilst ignoring them in practice. 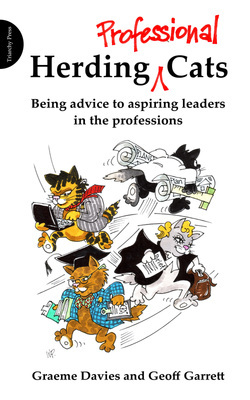 Herding Professional Cats offers advice and insights to leaders in the professions who find themselves facing the classic ‘cats’ dilemma – how to manage intelligent, opinionated, independent and frequently difficult people without losing the competitive edge a professionalised workforce can bring. With 40 years’ combined experience in leading top international academic and research institutions, Davies and Garrett have learnt strategies for dealing with the ups and the downs, the old and the new. Herding Professional Cats is a new edition of the authors’ 2010 bestselling book Herding Cats. It draws on their own top-level leadership experience and contains the information current leaders might wish they had known when they set out on their leadership careers. Davies and Garrett combine wisdom from senior academic and research colleagues around the world with new insights from experienced and perceptive leaders in a variety of professions, from lawyers, accountants and architects to consultants, doctors, journalists, public servants and even politicians. the all-important ‘communication, communication, communication’. These are presented in a pocket-sized guide in clear, easily navigable sections so that any professional leader faced with their own cats to herd and inspire will have all the tips readily to hand. “‘Herding Cats' is brilliant... a 'must read' for all academic and research leaders - before and after they take up these positions...The book is full of extraordinary insights... it should not be read once, but again and again, since the strategic guidance it provides is so invaluable." "This is a little (literally) book large in wisdom. It captures countless years of contemporary wisdom gleaned from experienced managers of research and academic enterprises, and it will appeal to the experienced and the novice alike. I can see an immediate use as an aid in mentoring new-comers to management. Short, pithy, well-signposted and easily navigable, it is an essential 'how-to' manual that all leaders in research will want to keep close at hand. A great read!" People in, or aspiring to be in, a leadership role in one of the professions as well as anyone with responsibility for leadership development in professional companies and organisations.